We start with Poison Ivy succumbing to an alien being and attempting to raze the world, before the remaining four issues deal with the fact that Catwoman knows who Batman is, and someone will stop at nothing to get that information. This leads Talia Al Ghul to ask Zatanna to remove these memories. But what is her real objective? Despite the departure of Paul Dini, this series remains as strong as it has ever been. The use of the men in each of the Sirens’ lives is an interesting way to arrange these two stories, as well as the first arc of the next volume. It is easy for female characters to be defined by the relationships they have with the male characters, but that isn’t the case here. The Strange Fruit arc is fairly straightforward until the final few pages, where Harley and Ivy share a heart to heart that snaps the latter out of her reverie. It’s here that we begin to realize just how similar that these three women are, and the parallels between their relationships with men. They can (and do) draw on each other for strength, whether it’s Harley trying to stay away from the Joker, or here Ivy fighting the influence of a plant-man. It cements the relationship that these characters have with each other by tying together their common plotlines. The four part arc with Zatanna and Talia is deceptive. The first two issues seem like your standard “who is the mystery man” arc, but the second two issues turn this all on its head as you realize everything is not as it seems. The final issue especially shows that whilst some characters are tied to male characters strongly, Harley, Ivy and Selina are doing their best to get past this restriction. I especially like how these tales bring our three heroines (anti-heroines?) together in time for the final pages of the last issue in which their relationship begins to show cracks and fall apart. This extends into the final two arcs of the series which will hopefully be collected, and when read together as a whole shows how the three evolve and change throughout the series. Given that the series then comes full circle by the time issue 26 comes around, I like how Bedard and Calloway have this story evolution in mind. On the art side of things, Andres Guinaldo handles most of the work here and does a fantastic job. Harley, Ivy and Selina all have distinct body types and this extends to Talia and Zatanna when they appear, and this is essential with an almost all-female cast. He has a great grasp of scenery and how it should be arranged, and his depiction of Ivy’s powers is superb. The fact that he also requires a translator for his work (from what I’ve heard) is also testament to how good an artist he is. 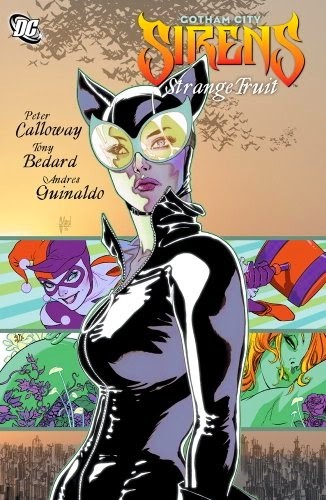 I know lots of people jumped ship when Paul Dini left Gotham City Sirens, but the series has only gotten better under Bedard and Calloway’s pen. They develop the three main characters in their own ways, drawing them together to make their fall from grace even more terrible to behold. This is another action packed volume that fans of the characters should definitely grab.